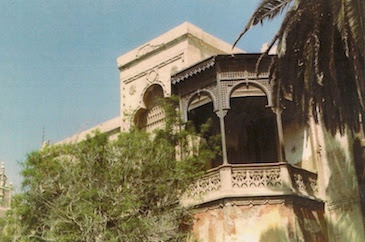 The home of George Valassopoulos at 9 Rue des Fatimites in Alexandria. When E M Forster was in Alexandria working for the Red Cross during the First World War he came to know George Valassopoulos, a lawyer in the city and a fellow graduate of Kings College, Cambridge. Forster often called round at Valassopoulos' home at 9 Rue des Fatimites in the Quartier Grec. There Valassopoulos would lead Forster through the poems of their mutual friend Constantine Cavafy in their original Greek and also provided him with elegant and, Cavafy felt, faithful translations. Valassopoulos became their chosen instrument for rendering the poems into English so that Forster could introduce them to the English-speaking world. 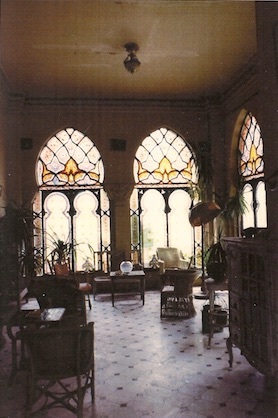 Valassopoulos' living room where Forster and Cavafy came as guests. Forster first became acquainted with Cavafy's poetry at the home of the poet himself at the Rue Lepsius. One evening 'a poem is produced - The God Abandons Antony - and I detect some coincidences between its Greek and public-school Greek. Cavafy is amazed. "Oh, but this is good, my dear Forster, this is very good indeed", and he raises his hand, takes over, and leads me through. It was not my knowledge that touched him but my desire to know and to receive'. Here is the translation of The God Abandons Antony done by Valassopoulos. your life's work that has failed, your schemes that have proved illusions.